I watched Bobby Jindals re-butal speech on last night and thought it to be ridiculous: First of all it was Former governor, Kathleen Blanco who fought for disaster assistance, when Katrina and Rita hit the coast of Louisiana. Today, there are still many residents who need help, not only with disaster assistance, but healthcare is not affordable in this state, not to mention how jobless statistics, and please, look at education in this part of the state: I think it is stupid and an act of retalliation, because Democrats are back on top of the things and Republicans are aimed at giving President Obabma, hell for winning. Republicans need to go with the flow, and help make this paln work. Most people that are hurting did not vote for Bobby Jindal, but we did vote for President Obama. When there is one person in the world who can get us out of this mess than it's Barack Obama. Whole Europe counts on him. And what about America? We hope that also the Republicans finally will get it. Former President Busch will do a tour and give speaches and the press is not allowed. He certainly knows why. A good advise to him: he better not come to Europe. Don't call it a mandate! I am behind our current president, and I want nothing more than for America's economy to turn around. However, calling President Obama's election a mandate is insulting to the 48% of American citizens who did not vote for him. As someone who has been fiscally responsible and has made recent sacrifices to stay that way – I acknowledge that I will not see (and am not asking for) any bailout funds, and that my tax burden will be increased as part of his tax-cut roll back. Please just acknowledge that I did not vote to subsidize earmark policies just because the electoral college votes in my state went in his favor. 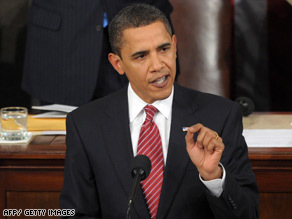 I will be positive about Obama's speeches when there are results to back up his talk! Why is the white house Chief of Staff a citizen of Israel? Why did he volunteer in the IDF during the gulf war, why not join the U.S. military? President Obama should be given all the due respect, hope and patience to lead us out of the mess he inherited and to lead us forward into better times. With all the important issues he is confronting at once, including the economy, the environment, education, health care and security both here and across the world, how can a true fair-minded loyal American not give him a chance to implement his programs? Only after assessing all the issues and situations objectively and realistically after they have been given a chance to succeed on their own merit, should anyone criticize what he is trying to do. He is our new leader – a man who posseses great vision, intelligence and love of this country – and he deserves credit for his prompt attention to so many critical issues. @Eric You are always a negative. The President has the ability to capture and control you so you hang on to every word he says. Even if you do not agree with him he is a tremendous orator. We are so not use to that and it is so refreshing. I loved the positive tone of the president's speech last night. When my daughter was four months old I was told that she would never walk, and possibly not even be able to push a wheel chair. I kept believing for her anyway. It's amazing what the human spirit can achieve when it believes something. Of course most people felt sorry for me and had sympathy in their eyes when it came to the thought that I was believing this. At four months of age my daughter's body was like that of a whole chicken in a supermarket. I had been around tons of children, so I knew that she wasn't suppose to be this way. You know what, I would speak positive things to this infant because I knew she would believe me. Believe- is the start of it's own unknown path. President Obama, I agree with you, that American's have accomplished some great things and will continue to do so. President Obama did a wonderful job and we who put him in office know that it will take time for out Country to become healthy again. It took time to get her ill and now time to repair her. It's time for the Republican Party to work with him instead of against him by listening to Rush L who acts like he's back on drugs again. Jindal was a mess.He should have cleaned the wax out of his ears because we all know what President Obama said and some of the issues Jindal talked about he acted like he was listening. Jindal is boring and acted like he was Mr Rodgers talking to a bunch of day care children. OK! OK !! OK!! NOW HOW ABOUT A BAIL OUT FOR THE MILLIONS OF APARTMENT DWELLERS !!?? MY NAME IS ROBERT S.I LIVE OR RATHER TRYING TO LIVE IN ORANGE COUNTY CALIFORNIA, I HAVE'NT HAD A SECOND JOB ON OVER 8 MONTHS, YES TODAY YOU NEED 2 JOBS TO SERVIVE, ASK ANYONE, ANYWHERE!! I HAVE NEVER MADE OVER 27,000 A YR IN MY LIFE,I'M IN DEBT TO OVER 100,000, I JUST LOST MY CAR BECAUSE I COULDNT AFORD TO REGISTER IT,LET ALONE PAY FOR THE NO TAGS VIOLATIONS AND PAST PARKING TICKETS,NOW I'M BEING SUED BY THE IMPOUND COMPANY BECAUSE THEY COUNDNT SELL THE CAR !! AND MY STUDENT LOAN WANTS A GOOD FAITH PAYMENT OF 975.00 I MAKE JUST OVER 1,000 A MONTH PLUS TIPS ,MY RENT ALONE (MY SHARE )IS 600 a month,200 for a co-sign load to sallie mae,maybe 150 for food shopping,50 for utilities, $4 a day for bus fare ( 5 days a wk = $80) WHERE IS MY BAIL OUT !!?? COME ON PRESIDENT OBAMA, WHERE IS IT, HOW DO I SURVIVE, HELP ME I'M NOT AFRAID TO WORK, I JUST CANT FIND IT , HELP ME NOW !! I MEAN RIGHT NOW !! RIGHT NOW TODAY, I'M 1 PAYCHECK AWAY FROM BEING HOMELESS, WHICH WOULD BE COOL BECAUSE THEN THE BILL COLLECTORS WOULDN'T BE ABLE TO FIND ME !!! HELP ME AND OTHERS LIKE ME NOW !!! RIGHT NOW !! NO BAIL OUTS FOR BANKS, NO MONEY TO FUND BUTTERFLY STUDIES, WE NEED HELP TODAY !!! NOT IN THE YEAR 2010 !!!!! liberals are numbed and stunned... Clinton said he sounded negative.. Seems there are 2 sides. Those that want the government to do whatever it takes no matter the cost of money or true freedom to fix all problems, the social democrat Swedish model. The other side wants the exact opposite. … Citizens say they like and want freedom. But in reality they want the government intervention in anything that affects them. Understand you really can’t have it both ways. You may think you can. But that is not true. I will not even bother to debate the case. I will let the next few years prove my point. I too, am a Louisiana resident. I too had damage from Hurricane Rita. I didn't wait for the government to come to my rescue. I paid my insurance and was able to repair my home. I believe a lot of the people who had damages from Katrina and Rita were irresponsible and didn't pay their insurance, they just wanted to sit back and live off taxpayers. I wish them well. I did not vote for BHO, I think he's a disaster far worse than any hurricane we could face. I am proud of our Governor. After hearing the list of comments made by our etseemed congressman made during the state of the union address, I could not help but think back to middle school and passing notes during class. Then I remembered detention. Shouldn't there be some sort of punishment for not paying attention to your teac...I mean boss...I mean employer...Oh yeah, THE PRESIDENT. If our "leaders" cannot sit through a 75min speech about the current condition our nation is in, do they really deserve these positions. Punishment is in order, maybe a fine for insubordination or maybe suspension. After all, if they are acting like preschoolers, lets treat them like preschoolers.